Notre Dame is headed to the Atlantic Coast Conference. It won’t happen overnight but soon Notre Dame will be leaving the Big East Conference to see what the ACC is all about. In a shocking announcement today the Fighting Irish’ athletic director, Jack Swarbrick, and the school’s president, Rev. John I. Jenkins, joined ACC commissioner John Swofford for a news conference publicizing news that the school would be breaking up with the Big East and joining the ACC for all sports except for football. 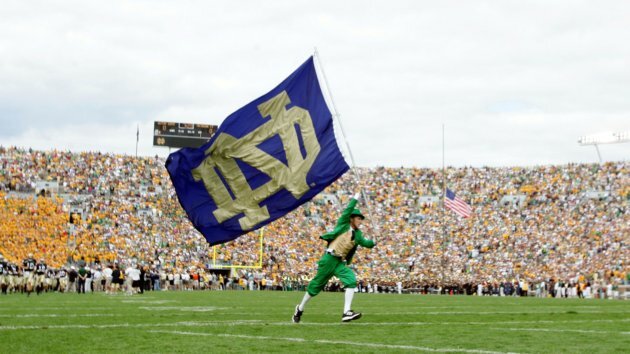 Anyone who knows anything about college football knows that Notre Dame doesn’t play like all the others; in fact, Notre Dame prides itself on its independence in the sport. See, Notre Dame isn’t a member of any conference in college football. They can schedule whoever they want. They have a very lucrative television deal with NBC (the network has presented all ND home games since 1991), and they do not have to share any of that money with their conference affiliates. They also don’t have to get through a daunting season or even a conference championship game. While every other college football program in the country was playing poker, Notre Dame was off playing blackjack in South Bend, Indiana. Today, while Notre Dame did maintain their “independence”, the game changed on those Irish eyes. A real playoff system is coming to college football after the 2014 season and with it brings a ton of torrential ramifications. The biggest news might be the desecration of the Big East Conference (in all sports outside of basketball…and that could be debated too). The move to four power conferences is coming, slowly, and it appears that the Big East may stubbornly decide to ride out with a “basketball conference” in a football dominated world. Losing Notre Dame to the ACC is yet another sign of that, and honestly doesn’t make nearly as much of a difference to the school as it does to the reeling conference. What does matter is that with this announcement is that Notre Dame has agreed to play five ACC opponents annually in football, while the program holds on to its “independent” status for as long as possible. Historic matchups like any Florida State vs. Notre Dame, or Miami vs. Notre Dame will be showcased once again. The Fighting Irish rivalry with Boston College will also be rekindled (the “Holy War” series, if you may). With this move, Notre Dame football will have seven games to schedule on their own and will be locked into five games versus the ACC each year, which should make for interesting scenarios as the Irish decide to fill out the remainder of their schedule each year. And of course, the Irish will be participating in Atlantic Coast Conference baseball, basketball, soccer, and every other sport you can imagine besides football and hockey (Notre Dame is expected to join Hockey East as the ACC doesn’t sanction hockey). New rivalries will be formed as history is made, and eventually the time will come when it’s either commit to the conference fully or get out. Today’s announcement is exactly like a man proposing to his girlfriend, her saying yes but still being able to fool around on the side until they finally do get married, and then that wedding day maybe never coming. The wedding day would Notre Dame joining the conference full-time, football included, and that day could and probably should come one day soon. Today’s move is a great first step towards making that a reality. What are your thoughts on this announcement? Love it? Hate it? Don’t Care? Wish Notre Dame would start their own conference? Would love to hear your thoughts/comments. This entry was posted in NCAA and tagged ACC, Big East, College, College Athletics, Fighting Irish, Football, Irish, NCAA, Notre Dame, Sports. Bookmark the permalink.